Along with our goal of eating better at home, I've been working on packing healthy lunches for the days that I work. Unfortunately, my work is right across the street from both a Wendy's and a McDonalds, and it's all too tempting to just head across the street and pick up something quick. This week, though, I made an effort to choose some healthy lunch options at the grocery store, and I've been eating super well! It's amazing what a difference it makes in my day when I have a healthy, delicious lunch. I have more energy, and it's easier to think clearly. It's an all around win! I saw a similar wrap on Our Best Bites last week, and was excited to experiment with the idea. I ended up making these wraps for lunch one day at work, and then for dinner at home on another day. Geoff despises tomatoes, so I knew that if I made bruschetta, I would be the only one to eat it. I opted instead to just add tomatoes to my wrap, and leave them out of Geoff's. I also added some avocado, which was delicious in combination with the pesto. This is definitely one that I'll make again! Combine mayo and pesto, and toss chicken in pesto mixture until well mixed. 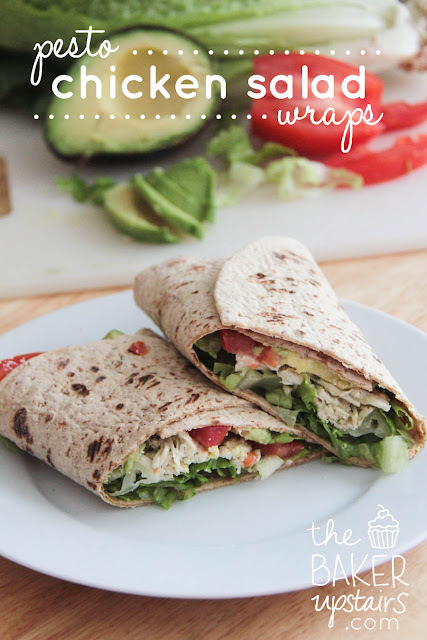 On each wrap, layer one cup of romaine lettuce, 1/2 cup chicken salad mixture, tomato slices, and avocado slices. Sprinkle a little parmesan over the top, and roll up. These wraps keep well in the fridge for a few hours (especially if you try to avoid direct contact between the wraps and the tomatoes), so they are perfect for lunches! New name? New look? I like it!